CRGA works with many of our clients to provide architectural and interior design services related to master planning and ongoing renovation projects within their existing facilities. Below are a few of the renovation tasks performed for the University of Maryland Medical System’s UMMC Midtown Campus facility. As a follow-up to our programming and master planning efforts, CRGA worked extensively with the Owner, Contractor, Clinical, and Administrative staff to design, implement, and oversee a complete seven phase renovation of the Hospital’s existing Emergency Department. The intricate phasing plan developed in conjunction with the master plan allowed for minimal disruption of the facilities 24/7/365 clinical operations while also minimizing construction mobilizations in order to keep associated costs in check for the full 24 month construction period. As part of UMMC Midtown’s ongoing effort to renovate and upgrade their existing patient units, CRGA worked closely with the Client to implement phased renovations within the existing 3rd floor patients, totaling 28,000 gsf. The scope of renovation included in Phase 1 required partial demolition and reconfiguration of approximately 17,000 gsf of space within the existing Internal Medicine Unit located on 3 South. Renovations included a major overhaul to the 1950’s era toilet rooms previously shared between existing patient rooms so that each patient room included a much larger and more importantly private toilet/shower area. This phase also included HVAC infrastructure upgrades as required to remove the existing induction units in favor of a forced air system. 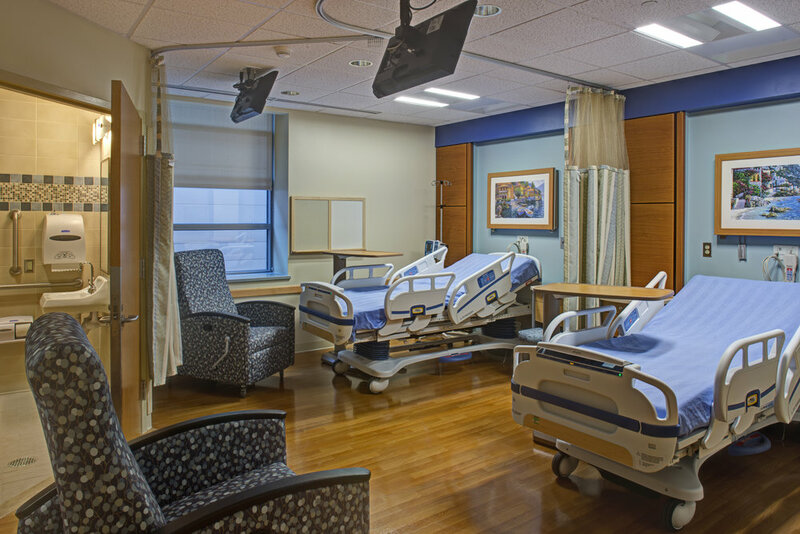 Phase 2 of the project included a complete gut and renovation of approximately 11,000 gsf of space as required to relocate the existing Telemetry Unit from the 6th floor to 3 North. Scope or work associated with this project included a new centralized nursing station, 2 new satellite nursing stations, 18 enlarged / fully reconfigured patient rooms with fully accessible European style shower rooms, and fully reconfigured clinical support spaces strategically located to enhance staff workflow and increase productivity. In order to accommodate the growing community need of the campus, CRGA designed the fit-out of 4,500 gsf of vacant space on the ground floor of the Professional Office Building, located on the Hospital’s campus for use as a new Urgent Care Center. Renovations included a new vestibule addition allowing direct access to the clinic from the exterior without entering the POB while also addressing a significant elevation change between building and existing grade, eight (8) Examination rooms with room to expand as the program grows, and a digital radiographic room.